Almost everybody is in agreement that repairs to the system are badly needed. Take, for instance, the infrastructure networks in Washington state, Georgia, and North Dakota, which recently earned mediocre grades from the American Society of Civil Engineers. The inability by state officials from those states to alleviate highway congestion ranked high on the list of concerns spelled out in the report cards. Washington and North Dakota earned a “C” and Georgia did slightly better with a “C+.” Keep in mind, just two years ago the engineers gave the country’s overall infrastructure a “D+” grade. 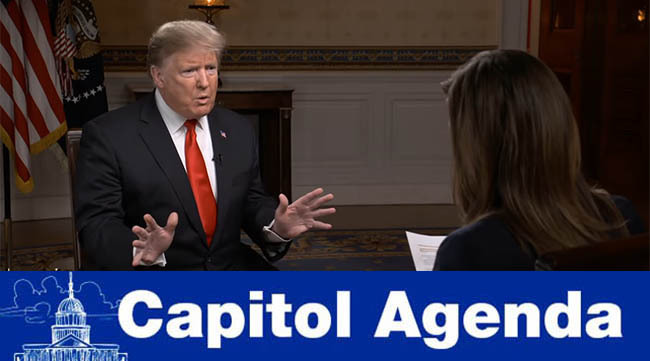 While Speaker Nancy Pelosi’s first face-off with Trump lived up to the hype, the Democrats in the House and the staff at the White House have yet to reveal details of their discussion about infrastructure. The fight over Trump’s wall that Mexico was supposed to pay for consumed all of January’s media energy in Washington. With a Feb. 15 funding deadline fast-approaching, the wall fight is expected to dominate Beltway politics most of this month, as well. Transportation observers tell us they worry the longer it takes policymakers to craft a long-term infrastructure bill this year, the harder it’ll be to advance it to the president’s desk prior to a fall 2020 authorization deadline. There’s comfort in knowing that Senate Republican leaders, who have not unveiled an infrastructure proposal during Trump’s presidency, say they’re ready to work on a bill. Feb. 4, 9 a.m.: The National Transportation Safety Board unveils its Wanted List of Transportation Safety Improvements. Feb. 7, 9:30 a.m.: The House Transportation and Infrastructure Committee kicks off the year with a hearing to examine the cost of inaction on infrastructure repairs. New T&I Chairman Peter DeFazio (D-Ore.) promised to craft a big infrastructure bill that would rely on “real” money. As he put it, “It is only fitting that the first full committee hearing will examine the current state of our roads, bridges, transit systems, ports and airports, and what will happen if we do not immediately begin to address the massive backlog of critical needs.” Witnesses have not yet been announced. Feb. 5, 8 a.m.: The U.S. Chamber of Commerce hosts a summit titled, “America’s Infrastructure: Time to Invest.” Participants include: Gary, Ind., Mayor Karen Freeman-Wilson; San Antonio Mayor Ron Nirenberg; Ferndale, Mich., Councilwoman Melanie Piana; Rich McArdle, president of UPS Freight; Jennifer Aument, president for North America at Transurban; James Strange, vice president of Advanced Electrical Systems; Thomas Donohue, president of the U.S. Chamber of Commerce. Feb. 5, 10 a.m.: Senate Environment and Public Works Committee meets to consider the nominations of Andrew Wheeler to be administrator of the Environmental Protection Agency, and Nicole Nason to be administrator of the Federal Highway Administration. Feb. 5, 9 p.m.: President Donald Trump delivers the State of the Union address. Watch live. Feb. 8, 11:45 a.m.: The Hudson Institute hosts a discussion titled, “The Vanishing Congress: Reflections on Politics in Washington.” Speakers include Rep. Mike Gallagher (R-Wis.). With the State of the Union expected to be used as a canvas for the president’s 2019 vision for infrastructure, the chances of a bill getting done later this year could improve. The U.S. Chamber of Commerce’s infrastructure funding pitch is put under the Jeff Davis budget-analysis microscope. When he meets with the White House’s Larry Kudlow this week, House T&I ranking member Sam Graves (R-Mo.) plans to discuss infrastructure policy priorities and what is achievable in terms of pay-fors, sources tell us. Jim Jefferies got the memo. Some people dread moving. Not Sen. Tim Scott’s staff. State and federal government just ignores those towns, like my hometown of Mansfield. And those towns are often racially mixed. This isn’t a metro, diverse, metro area versus a white, rural area. These are small towns that are hurt from globalization, hurt from a tax policy. Sen. Sherrod Brown (D-Ohio) Feb. 3 on Meet The Press.